Scott Temple emerged dominant from Zwartkops’ second round Investchem Formula 1600 races with pole position and a couple of race wins to consolidate his championship lead, but it was a somewhat fortunate win after the Cape Town youngster forfeited his first race win following a jumped start. Despite weather forecasting Friday’s rain to continue, a sunny if nippy Pretoria morning greeted hundreds of race fans setting up camp all around the track for a great day at the races with news soon breaking that reigning champion Stuart White has headed overseas to take a soon to be confirmed international racing seat. Temple meanwhile powered his Road To Race/1st Race Mygale to pole position, five-hundredths of a second quicker than on-form youngster Rackstraw’s Investchem/Race Driver SA Mygale with a surprise in third as Gerard Geldenhuys put his Abacus Divisions Mygale on the inside of the second row. 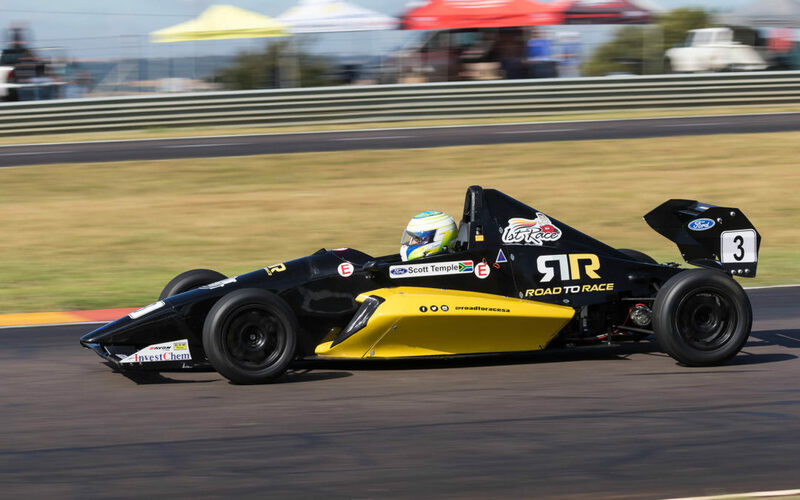 Nicholas van Weely sat fourth in the Magnificent Paints & Hardware van Diemen ahead of Andrew Schofield (Investchem Mygale), Siyabonga Mankonkwana (Investchem Cervinia Mygale) and Alexander Gillespie’s ERP Trucking Components Mygale. Tiago Rebelo (TRMS Mygale) headed up the fourth row ahead of rival young gun quartet, impressive top rookie Zac Edwards (SCM Mygale), Liam Pienaar (Phoenix Jewellers Mygale), Class B leader Ivana Cetinich (Alpha Universal Mygale) and Alex Vos (Ecurie Zoo van Diemen), with Class B man Allen Meyer (van Diemen) and Brendan Tracey next up in the absent Ian Schofield’s Investchem Mygale. Except for Rackstraw, Zwartkops is most of the field’s home track but that did not prevent the young Capetonian from leading the field away to take the flag first from Temple, Geldenhuys, van Weely, Schofield and Rebelo. All was not however as it may have seemed, as the gutted Rackstraw was controversially deemed to have jumped the start as his car rolled slightly forward as the lights went out and picked up a 30 second penalty to plummet him to 12th and out of the points. Andrew did set the fastest lap to earn the scant reward of a solitary FTD point, but that promoted the rest up a position, with now Gillespie sixth from Pienaar, Mankonkwana, the rookies, Class B winner Cetinich, Vos and Edwards, the demoted Rackstraw, Tracey and Meyer. Temple made no mistakes to take the second race and nor for that matter, did Rackstraw err this time around as he chased Scott home in second ahead of van Weely, Schofield, fired up young lady Cetinich and Mankonkwana in sixth. Young Alex Vos was another driver to impress in seventh ahead of Rebelo, Gillespie, Pienaar, Edwards, Tracey and Meyer as Geldenhuys hit trouble six laps in.